I went fishing this morning around 8:30 a.m. as I live on the shores of Castle Brook which flows into Memphrimagog Lake. I was going east (towards the other side of the lake) when, suddenly, in the middle of the lake facing LaFrenaye Bay, between Eagle Island and the first island of the Three Sisters Islands, my attention was drawn to a reflection in the water. The lake was very calm and the sun was facing me. There was a wave shining in the water; but it was more than a wave, it was like lights shining at night, although it was day time. When this luminous effect caught my eye, I saw what seemed to be the shape of a whale - (I've seen them fairly frequently on my trips to the North Shore). There was no tail or head. It was approximately 800 feet away from me and measured about thirty feet. The reflection was so intense that it looked like it would be the front end of the animal (see my drawing that shows fairly well what I saw). This phenomenon lasted about three minutes. I had enough time to approach it; it eventually dove back into the water without returning to the surface. Even if the lake was calm at that very moment, I saw a huge wave coming towards me (it was more like three massive waves) and when this wave reached my small 14-foot boat, it lifted the boat quite high. I made a comparison about a half-hour later when a boat passed by me and the wave was a much smaller one then. I occurred to me that the animal in question had moved a volume of water much bigger than the 1000-2000 pound boat had. I figured that the impact was at least three times more powerful. I looked around to see if there were any other boats that I could contact to see if they had witnessed what I had just seen but there weren't any. This wasn't a hallucination and it did look like a whale (as I said before). The animal was black and shiny, about 30 feet long and was moving very slowly. Lake Memphrémagog, an international lake located in Canada and the United States, 70 miles east of Montreal, straddles the United States border. The white man has been living around the lake for only two centuries. Before this, the area was favoured by the Natives due to the abundance of game and fish. When the white people settled, the Natives told them they that would not bathe or swim in the lake because it was inhabited by a sea serpent. A document relating to this fact in 1816 confirms their fear. Last summer a Viking petroglyph was found on the top of a mountain near the lake. It describes a sea serpent. Archeologists are verifying this finding. Around 1980, I became interested in our history, intrigued by underwater findings while scuba diving; I started building archives and this brought me to the establishment of the société d'histoire du Lac Memphrémagog . I have found many old documents relating to sightings. One of the first sightings which dates back to January 21, 1847 came from The Stanstead Journal. Here is an extract: "I am not aware whether it is generally known that a strange animal something of a sea serpent....exists in lake Memphremagog..." I have also found on the same subject articles written in 1850, 1853, l855, 1866, 1877, 1879, 1892 etc.... 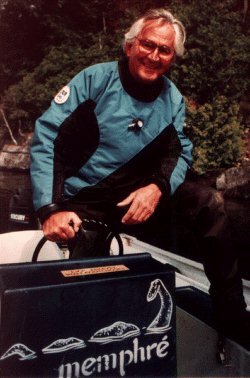 In 1982, a writer from France, Michel Meurger, wrote a book entitled Les Monstres des Lacs du Québec. It was later translated into English as Lake Monster Traditions. The documentation that I provided helped to write a complete chapter in his book. In 1983, after having completed over 1000 scuba dives, I had yet to find vestige or proof of an underwater lake-dwelling creature. I then decided to write an article on the subject on August 18, which was published in The Newport Daily Express entitled : Lake Memphremagog's Anacondo. My aim was to try to get some feedback. I did not have to wait long for an answer as I received a letter from lady from Newport,Vermont and here is an extract: " After reading your article on Memphremagog's mystery serpent ....I just had to write to you relating our own phenomenal experience the day before .....From out of nowhere appeared a brown object with a long wake etc... Should we believe there is a mystery serpent in lake Memphremagog or not?" Similar testimonies followed. Therefore, On June 19, 1986, I founded the International Dracontology Society whose objective is to study the phenomenon at length. Dracontology, a branch of cryptozoology, only studies unidentified lake dwelling creatures such as sea serpents. This name was officially recognized by Dr. Bernard Heuvelmans, founder of cryptozoology. It should be noted that in the years that followed (1993 to 2000 ) we collected in our archives 50 sightings involving 124 persons which now brings the total to 229 sightings to this day. We only keep signed declarations and declarations recorded on radio-cassette. We do not keep hearsay evidence. Time are changing and the openess of people is facilitating our research work. People come to our office describing their sightings. A Canadian television reporter said while standing at the head of the lake: "I am watching in case I spot "Memphré" but, even if I don't spot it, I think that I have had just as much fun talking about it as actually seeing it." Towards the end of 1995, we designed a pictogram that is now in around the lake to encourage the visitors to scrutinize the lake more closely in case they see "Memphré", our sympathetic creature. The legend of this pictogram: observation site for unidentified lake dwelling creatures. Summer 1996 was the twinning of Lake Memphremagog and Lake Ikeda of Japan. They are inhabited by unidentified lake dwelling creatures. 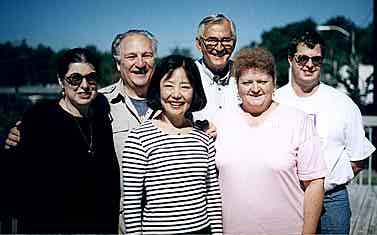 The photo is showing major collaborators: left to right: Ruth & Robert Colombo of Toronto and Mrs. Hiroko Yashuda from Japan. They visited us on July 22 and 23, 1997, Jacques Boisvert, Denise P. Marcotte - Pro-Mayor of Magog and Alain Van Einden, President of SIDAC.. -. ....Log Cabin Chronicles: Think of our Anglo/French/Yankee community Chronicles from the Lake Memphremagog watershed on the Vermont Quebec border as a cultural pit stop in the race towards the end of your life. Slow down. Come in for a visit. Fill up with your choice of good stuff. J. Robert Colombo : For his "Quote Books" he is known as Canada's Master Gatherer. He is known as Canada's Mister Mystery for his books in the field of the supernatural and the paranormal. He is a good friend to our society. Champ - Lake Champlain- Sightings, history, legend and a unique devoted researcher Dennis Jay Hall. The British Columbia Scientific Cryptozoology Club Home Page: Canadian one of the most exhaustive cryptozoological sites. The parasail mayor: A must to visit.